Lesley, I’m wondering what discouragements you faced in the process of submitting manuscripts? If so, how did you deal with these? I’ve had many rejections and still do. But it just doesn’t worry me. I’ve always been so grateful when someone read my work even if it led to a rejection. Writing is a business and stories are chosen and rejected for many different reasons. It’s not personal. You said at the launch for Bring a Duck that Margaret Hamilton helped you shave 1/3 off your original manuscript – that’s a lot! Margaret is so well respected in the children’s book industry that I’m sure you wouldn’t argue with her (and she was obviously right because the book as it is now is just right!) but how did that feel at the time and how hard was it to do? How did you make the decisions of what to cut? I really enjoy the editing process. Writing can be a lonely job. I just love when my story goes from being mine alone, to a creative group project with the editor and illustrator. This is where the magic happens and my story is transformed into something bigger and better than I could ever have imagined. My first editing experience was with Margaret Hamilton. I didn’t have a good understanding of length and ‘Bring a Duck’ was just far too long. Margaret cut off the last third of the story. It just wasn’t needed. I was so amazed at the difference good editing made! I’m so grateful for all the work my editors do. They are amazing and I always acknowledge their work on my dedication page with a special thank you. Receiving positive feedback from an editor, even when your work is rejected is always exciting and encouraging. Editors and publishers are extremely busy people so to have an editor take time out of their busy schedule to write to you is always a thrill. This really fast tracked my writing skills. 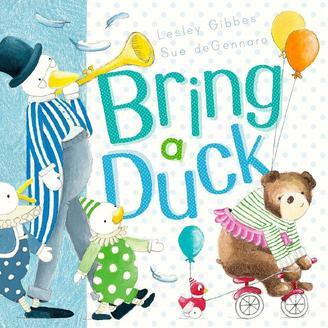 Scary Night and Bring a Duck have different publishers – how did that come about, and are your other books with other publishers? Four different publishing houses, Working Title Press, Scholastic, Allen & Unwin and Walker Books, currently publish texts I have penned. Not all texts suit the one publisher and my manuscripts have been placed where they are best suited. The two books published so far are picture books – what can you tell us about the others coming out over the next few years? I have two picture books coming out in 2016. ‘Little Bear’s First Sleep’ is a story about a bear cub who is embarking on his first long winter hibernation. It’s being published by Scholastic with Ana Vivas and is beautifully illustrated by Lisa Stewart. ‘Quick as a Wink, Fairy Pink’ published by Working Title Press by Jane Covernton and illustrated by Sara Acton is a cute hide and seek fairy bedtime book. Next year also sees the launch of the first four books in my chapter book series ‘Fizz’ published by Allen & Unwin with Sue Flockhart and illustrated by Stephen Michael King. These books are humourous, police dog adventure stories for children 5-9 years. Following on from these publications and heading into the future as far away as 2019 are two more picture books. ‘Fluke’ published by Working Title Press by Jane Covernton and illustrated by Michelle Dawson is a beautiful story about the whales in Sydney Harbour and ‘The Cicada Hunters’ Nature Storybook Series published by Walker Books with Sue Whiting and illustrated by Judy Watson is an info-narrative about cicadas embedded in a touching story about a grandpa and grandchild who go cicada hunting together. I can’t wait to see them all edited and illustrated. What a thrill! Lesley, they sound brilliant, I can hardly wait to see them! And I can’t believe the line up of illustrators you have for your books – some of the best names in the business! Congratulations! Next month is the third and final installment of this interview with Lesley.